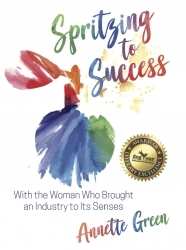 “Spritzing for Success” by Annette Green has earned the Dog Ear Publishing Award of Literary Excellence. The fascinating book details her experiences with spearheading the rescue of a beleaguered industry and turning it into one worth more than $4 billion today. New York, NY, October 01, 2018 — The story of an underdog rarely fails to capture readers’ hearts, and that’s the case for the most recent winner of the Dog Ear Publishing Award of Literary Excellence. “Spritzing to Success with the Woman Who Brought an Industry to Its Senses” by Annette Green tells the backstory of how the author strategized a rescue of the bankrupt Fragrance Foundation created in 1949 to be the educational voice of the then-small ($500,000) industry in the United States. In the process (which she did pro bono) she set the industry on the path to extraordinary growth. Today, fragrance is an industry worth more than $4 billion. Award of Literary Excellence winners are determined by the company’s editorial team. The managing editor, editorial services manager and the publisher review its recommendations, and only a few books each year achieve the honor. She believes her book received the award because of her “ability as a storyteller to reveal how one can prevail, against the odds, to reach the heights of self-fulfillment through pure grit and determination. It lays out a path for anyone willing to turn their passion into a purposeful pursuit of a goal,” Green said. The publishing company’s editorial staff appears to agree. And Green isn’t done with helping improve the world around her. Net proceeds from the sale of the book will support scholarships for students in the bachelor’s degree program in fragrance and beauty marketing at the Fashion Institute of Technology in New York and the Annette Green Perfume Museum at the Fashion Institute of Design and Merchandising in Los Angeles. The book, published Sept. 1, has had a strong promotional start. Green said on Nov. 6 “Spritzing to Success” will be the focus of a major panel and book-signing event to be held at the Fashion Institute of Technology in New York. It will be held in conjunction with the Fragrance Foundation. She and her team are planning similar events keyed to book signings. In 1998, Green and Linda Dyett wrote a well-received book, “Secrets of Aromatic Jewelry,” published in Paris, and over the years she wrote many articles, scripts and speeches for herself and others. For additional information, please visit www.spritzingtosuccess.com.